Sixteen year old Jackie Fields won the Olympic Featherweight Boxing Championship in 1924. Five years later, he captured the World Welterweight title. The name was Jacob Finkelstein when he was born in Chicago. 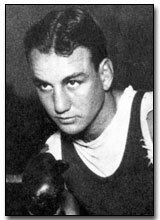 But when his family moved to Los Angeles in Jacob’s early teens, he became Jackie Fields, joined the Los Angeles Athletic Club, and quickly established himself as one of the nation’s leading amateur boxers. Jackie held the World Welterweight crown twice--1929-30 and 1932-33. The first time, he beat Young Jack Thompson for the title, then lost it back to Thompson 14 months later. Jackie defeated Lou Brouillard to recapture the championship, and lost it 13 months later to Young Corbett III. Jackie Fields was the youngest man ever to win an Olympic boxing gold medal and, to this day, it is believed he still holds that distinction. His road to the Olympics put him in fierce competition with his Los Angeles City College pal, Joe Salas, who was regarded as America’s number one featherweight boxer. As fate would have it, the two met in the finals for the Olympic gold medal, and Jackie won a three-round decision. Later that year, Joe and Jackie turned professional and made their debuts--against each other. Again, Jackie took the decision, this time in 10-rounds. The Fields-Salas saga was made into a motion picture in 1939: “The Crowd Roars”.